The Perfect Gift For the Gardener in Your Life! Turn rocky soil or raw compost into filtered topsoil! Sift seeds for storage and future use. Also great for rock hounds, treasure hunters, archeologists, crime scene investigators, and forensic scientists. Smaller models are perfect for Bonsai enthusiasts! Look for our newer models, or suggest one of your own. From this page you can access all the pages of our site, including the main ordering page that includes a listing of all our handy products, developed over the past seven years in response to our customers' needs, and a discussion of how to order and how to use our Sifters. PLEASE NOTE: We are now experimenting with shipping outside the continental United States! However, you will not be able to order directly from the Order Page. Please Email Us and tell us exactly where you are located and what you want to order and we will respond with a quote. Import duties, taxes, and charges are not included in the item price or shipping cost. These charges are the buyer's responsibility. Please check with your country's customs office to determine what these additional costs will be prior to buying. Thanks! 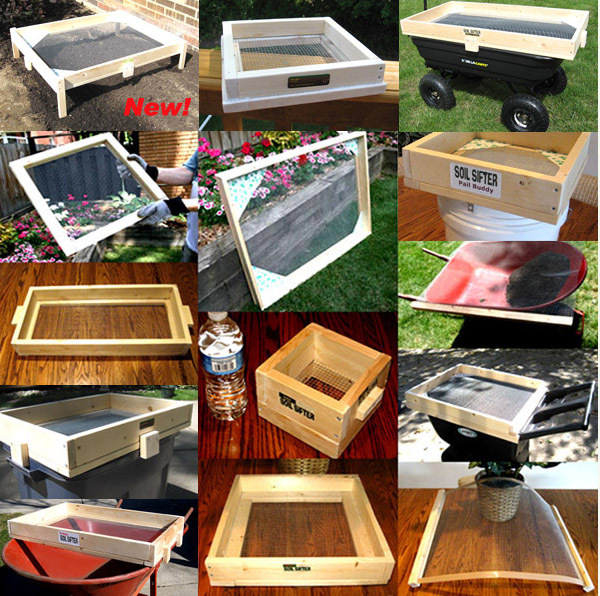 Order Your Soil Sifter today! From Better Homes and Gardens -- everything from milk cartons to newspapers to chopsticks! The very comprehensive and useful site for gardeners on the mega-site About.com. A nonprofit leader in plant-based education, serving a national audience with timely materials designed to foster an appreciation for the benefits of gardening. Lot of great information here! A favorite site for gardeners around the world, articles and videos show you how to start seeds and learn how to make a garden. Members can chat with other gardeners in forums, and learn how to identify plants, pests, birds and butterflies.